Race in the Winchester country side. An excellent course for runners of all levels and a fun family friendly atmosphere to go with it. With a great friendly atmosphere the Winchester Half starts and finished just outside the beautiful guild hall right in the centre of the town. This is a fairly flat course that takes you deep into the countryside where you can enjoy running through nature. Included in this race is a bag drop, an excellent marshalled course and a free micromesh tee-shirt, bananas, water and goodies on the day! Heading through the Romsey Road and Sparsholt Road you will head out into the wonderful countryside of Winchester. You will then snake your way back to the Gulidhall for a spectacular Finnish. Buses – It couldn't be easier to get into the town centre just hop onto one of the BLUESTAR or STAGECOACH buses headed towards the city centre. Train – The best station to hop off at is Winchester. If you want to drive we recommend Barfield Park & Ride (SO23 9SQ) – the bus will not be in service but it’s a short walk to the start line! Come to the Winchester half ready to race! and don't forget to bring some warm kit to wear after! Bring your family and friends to support you at the Winchester half!! If you're aiming for a prize there is a no headphone rule, otherwise feel free to bop along to your favourite tunes. Being in the centre of town we are lucky enough to be surrounded by great coffee shops and other conveniences, we would recommend supporting local if you can! There will be toilets at Water Station 2 on the route. This should definitely be renamed the Half Marathon of hills, the amount of incline was enough to make you go weak at the knees! Fortunately in the latter stages, there was a fair amount of downs to make up for it - providing your legs still had it in them. Marked down slightly for the fact that the organisation wasn't great with everything being inside and the length of queues etc. but this couldn't be helped due to the awful weather conditions, hence the 4 rather than any lower. Special mention to the 2 hour pacers (Team 2) as they did a fantastic job in pacing and bringing people home in under 2, using the downhills and flats to get ahead of the pace for when you inevitably dropped off pace going up the hills - they were great. Also special mention to all the volunteers - they were incredible and the sheer amount of them out there supporting everyone was fantastic given the horrible weather conditions - really a worthwhile event! Plus the medal/tee weren't too bad either!! The course should be renamed the hill half. If you like hills then you will love this course. The first 3 miles are pretty much all up hill and then the rest of the course follows a similar pattern. The beauty of the area is outstanding and at times I found myself more focused on the area than the actual running. Good medal and event has pacers which i always like to see. Only negatives were the mile markers were wildly off and not as many drink stations as were required given it was a super hot day. Flat, this course is not. I'm not overly experienced at doing half marathons (having only previously done one in a race setting before this one), but this seemed tough. That said, it provided a great sense of accomplishment when finishing it. I was without doubt towards the back of the pack, and I was slightly confused about what happened to the first water station on the route. I was told by a friend of mine (who was further ahead) that it ran out of water just as he arrived. That was a bit of a shame, but really the only negative I haveto say about the event (well, that and the hills - but I knew they were there coming into it). The local support was great. There was a big stretch through countryside where you didn't see many people other than other runners and marshalls, but other than that, there were people there cheering you on which was good. Overall, I would rate this event very highly. It was well run - starting it outside the Guildhall works really well I think. I'm not sure if I will do it again (did I mention the hills?) but I would recommend it to anyone who feels comfortable with the distance who fancies a challenge. First thing to consider when entering this half is train for some hills, the first three miles is pretty much uphill, if you haven't trained for it you will have a very miserable race!! Saying that if you've prepared you will have an enjoyable but challenging day at a well organised half marathon, with scenic countryside book ended with a city start and finish!Easy parking despite the city centre location, with the added benefit of no charges on a sunday. Short walk to the start. Easy quick bag drop, and plenty of toilets in the guildhall.Start of the race is pretty narrow but quickly opens up especially when you hit the hill! There are two big long hills from the start and then again at 6 miles but what goes up, must come down so enjoy the downhills.Water stations at approx every 3 miles and Power Gel energy gels at half way. Heard rumours that first water station had run out of water for tail end of field but can't comment on this personally.Great support in the city and suburbs but quiet in teh countryside but enjoy the pretty views. Great support from the marshalls in these areas though.Great finish in the city centre, with some amazing noise from the crowd.Nice tech tee and medal, would recommend if you want a challenging city half marathon, just train for the hills! Shortly after the Winchester Half I jokingly tweeted my brief review “up, up, up, down, up, down, up, down, down, flat, up, up, flat, up, up, flat, up, down, down, flat, finish” in retrospect I now see the error of my ways. After reviewing my Strava route profile I now realise I missed out many more ups! 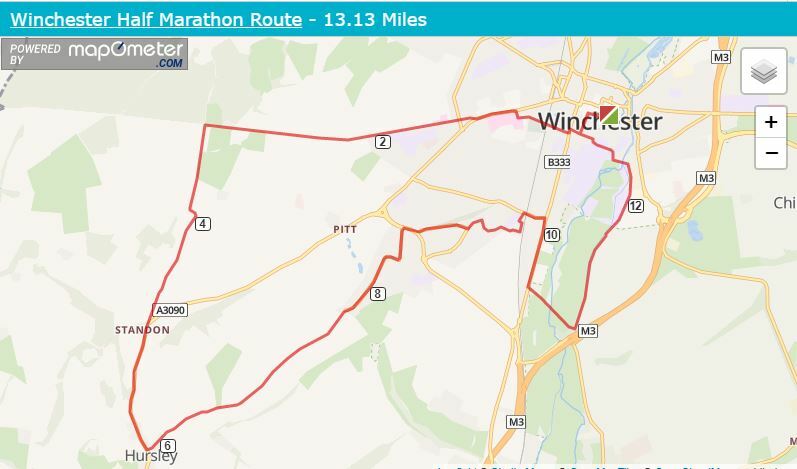 This is all in jest of course, the Winchester half marathon route is a hilly road race by comparison to the flatlands of Winchester city and surrounding towns but it’s by no means mountainous. With approx 1000ft of ascent for the 13.1 mile route it shouldn’t stop anyone considering entering. The majority of the climbs are done in two main drags with the first about a mile long and at quarter of a mile into the race and the second at about 6miles. Both are fully runnable, feel like they are going on forever but runnable nonetheless. Starting and finishing outside the Guildhall at the bottom of the city, the Winchester half heads out to the west, dives south before heading back to the start. Parts of the event are on closed roads and the remainder on quiet country lanes or secluded wide foot paths. The organisers did a great job with the route, especially considering the logistics of running a race in a city that could easily be gridlocked by an indiscriminate road closure. Within a mile and half or so you are off the main roads and onto quiet lanes. There were an abundance of friendly marshals, covering every turn and some even dotted around in between. The route was well sign posted and with drinks stations every few miles. The race culminated on the main high street with tonnes of spectators for the relatively small field of 1300 competitors making for a very raucous run down the finish funnel.Goodie bag at the end included: Medal, t-shirt, drinks bottle, water, banana, popcorn, Truestart coffee sample.Regarding my scores: Feed stations: dropped a couple of points since it was quite basic fuel available. Natural Beauty: dropped a couple of points since it was a road race with high hedges so not always much to look at. Course Uniqueness: dropped a couple of points because its a straight forward road race. I did this as part of a team event through our office. The motivation for doing this with others was great and highly recommended. On the day, i found the event well run and organised, although a little cramped and chaotic at the race HQ and toilets!The course itself i knew reasonably well as i work in Winchester. I knew it would be hilly, but had somewhat underestimated just how much!The initial stretch it took me about 4k to get into my rhythm as the roads were narrow and it was difficult to get past the amount of people at that stage. As the course progressed, people spread out and it was easier to pass people to keep pace going.The course was very scenic, and the support from locals was great. Water/Feed stations were good, well located and accessible.I would highly recommend this event, and would look forward to doing it again. ... and in the calf aswell because of those damned hills :) But the race itself was great. Winchester is beautiful and the residents were all over the route to support and give jelly babies. Nice T and bling at the finish and of course a well earned pint in the Crown & Anchor.